Back with one more recipe post . 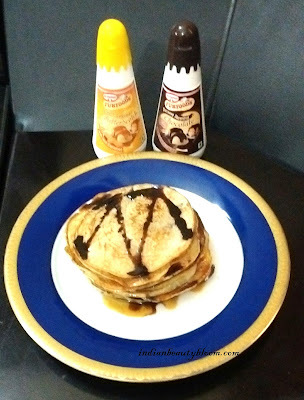 Today I am going to share recipe of Pancake along with review of Funfoods Dessert Toppings . 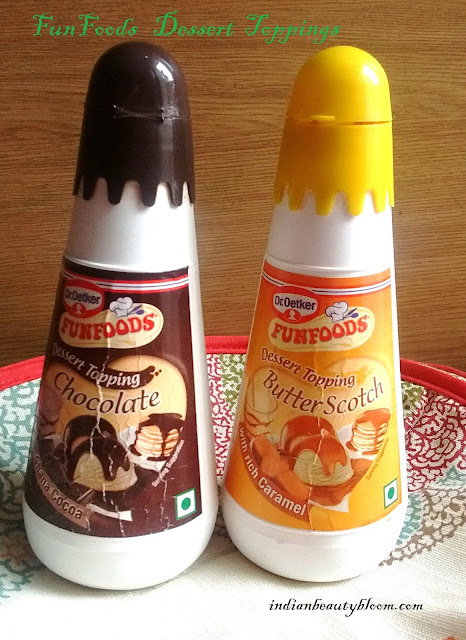 Dr Oetkar India is a famous Indian brand and Funfoods is one of it’s subs brands . It’s product range includes various products including cake mix , dessert toppings etc . 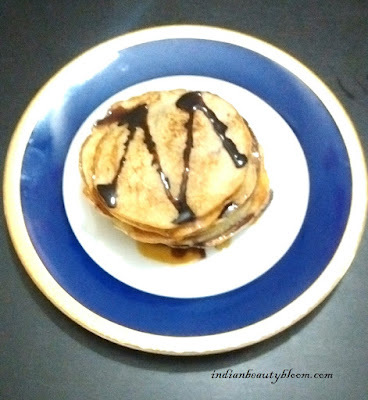 In today’s post I will share recipe of Pancake with Funfoods Dessert Toppings . This is a topping made with cocoa and coffee . It has smooth texture and offers a unique taste . Can be used as a topping on variety of desserts and sweet dishes like cakes , pancakes , cookies , brownie , Ice creams etc . It has a rich caramel taste . Perfect for topping on pancakes , cakes and Ice creams . 1. In a mixing bowl add flour , sugar , salt , baking powder . 2.Add milk and mix well so as there is no lump in the batter . 3. Add eggs and again mix well , the batter should be smooth without any lumps . 4. Heat Oil/ Butter in a Frying Pan , take a ladle full of batter and pour on the pan , let it cook one side and then turn it gently and cook the other side on medium flame so that it gets cooked from inside , once done take it out and prepare the next one . After preparing all pancakes one can stack them on a plate and add toppings as per their choice . I added Butter scotch topping on individual pan cakes and at last did the topping with Chocolate one. The Pan cakes turned out too good and delicious , Perfect for a Sunday Breakfast or Brunch . 1. Good quality products . 3. Affordable price ( Only 79 for 300 gms ). 4. Easily available every where . 5. Can transform a Simple dish into Delicious one . 6. Free of Preservative & Synthetic color . 7. Free of Gluten & Trans fat . 8. 100% vegetarian Products . I added these topping to milk and gave to my kids , they were more happy to drink milk with these then without . I also used these toppings on other dishes like Cakes , Cookies and it enhanced the taste of dishes . Delicious and Affordable ones .